If you’re looking to introduce a friend (or maybe even your parents) to Drunk History, “Philadelphia” is probably the episode to do it. It’s a textbook showcase of the series’ premise, set in the one of the most American History-est cities in American History and featuring an exceptionally strong cast of guest stars. Nick Rutherford leads off with the story of Baron von Steuben, the Prussian-born military leader who was recruited to train American troops in the Revolutionary War. As George Washington and von Steuben, respectively, Stephen Merchant and David Cross both inspire immediate laughs by wearing their modern-day eyeglasses in character. (Cross takes it a step further since his are transition lenses.) Rutherford smartly paints a flamboyant picture of von Steuben as a dog-carrying, fur-wearing drill sergeant diva, giving Cross abundant source material to work with. Merchant is his reliably funny self, but Cross really steals the show here. When Rutherford drunkenly proclaims that von Steuben “saved the world,” Cross puts the perfect button on the segment with his faux-humble, “Who, me?” shrug straight to camera. It’s classic Cross, and classic Drunk History. 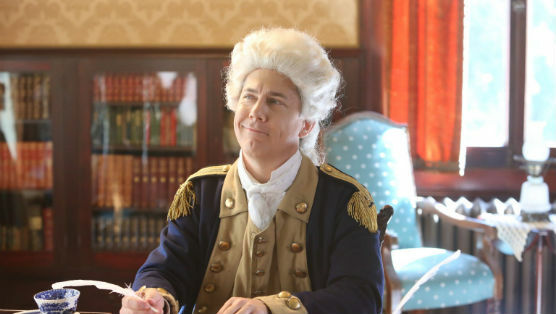 Next is the presidential election of 1800 between John Adams (Joe Lo Truglio) and Thomas Jefferson (Jerry O’Connell), as told by Patrick Walsh. In a time when Americans bemoan the dirty personal attacks used by current political campaigns, it’s intriguing to hear how revered founding fathers Adams and Jefferson were not above such tactics themselves. Walsh expertly escalates this premise, imagining that Jefferson publicly revealed Adams was hermaphrodite, and that Adams countered by accusing Jefferson of being dead. (“That’s a pretty good campaign,” Waters observes. ”’Vote for me, I’m alive.’”) Lo Truglio and O’Connell are more than up to the challenge, matching the absurdity with equally committed, over-the-top performances. Few things are funnier on Drunk History than historical icons angrily ranting with modern-day slang, and there’s plenty of that to go around here; Jayma Mays even gets in on the action as a miffed Abigail Adams. Walsh peppers in colorful asides, like having the characters “popping off” letters and referring to each other as “Tommy Jeffs” and “Johnny Ads,” that keep the laugh quotient high. The story even ends on a poignant note, with Walsh noting how both of these heroes of American history died (separately) on July 4, 1826—the 50th anniversary of the Declaration of Independence. A fact made even more impressive when you consider Jefferson was already dead. Erin McGathy rounds out the night talking about the treason of Benedict Arnold, played with petulant exuberance by Chris Parnell. Winona Ryder cheerfully chews the scenery as Arnold’s wife and accomplice, Peggy Shippen, and together they capture the OMG spirit of McGathy’s storytelling. John Lithgow pays a visit as George Washington and gets much more to do here comically than in his appearance a couple of weeks ago as William Randolph Hearst. All three benefit from the hilarious dialogue and delivery given to them by McGathy, and as a whole, the segment is greater than the sum of its parts. As you might expect from an episode about a city so rich in history, “Philadelphia” is solid all the way through, without a clunker in the bunch. I’m more skeptical about next week’s topic, “Sports Heroes,” since the episodes based on themes have been among the season’s weakest. But when Drunk History works, it really works, and “Philadelphia” proves why it’s one of the summer’s must-see shows.